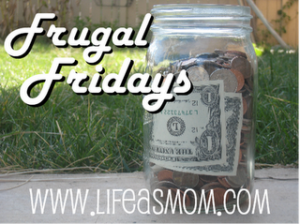 This is my first time to link up with Life as Mom's Frugal Fridays. I love that there are places on the internet where we can share money-saving tips!! 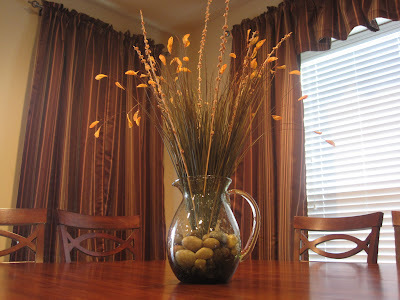 I don't know about you, but I'm always trying to think of ways to repurpose items that I have around the house. My latest treasure began as a tragic accident. I got a beautiful green glass tea pitcher from my friend Jessica for my birthday last year. Unfortunately, last week as I was pulling a jar of jalapenos out of the fridge, I knocked it against my tea pitcher & cracked it. It didn't break completely, but it wouldn't function as a tea pitcher anymore. I couldn't bare to get rid of it, though, because it is special to me! So, I decided it would be perfect to use as a centerpiece on my dining room table! I had been looking for something to put there, but everything that I had come across cost more than I cared to pay. I went to Hobby Lobby, where they had all their flowery/greenery 50% off. I already had the rocks that I put in the bottom to hide the ends of the stems. I think I ended up getting the whole thing for the price of a cup of tea! That looks great. Great job repurposing something that was special to you. That is so cute. I think it looks great. i love it!!! so creative.